Editors’ note: The following article was excerpted from the book The Science of Giving: Experimental Approaches to the Study of Charity, edited by Danny Oppenheimer and Christopher Olivola. The chapter, entitled “Social Influences in Giving: Field Experiences in Public Radio,” by Rachel Croson and Jen (Yue) Shang, provides an approach to understanding the role of social information in fundraising. While the public broadcasting environment in which the study was conducted may seem unique, we believe that this article holds implications for online fundraising specifically and also for individual donor fundraising in general. What social information about fellow donors and a donor’s own network has an impact on gift size? This article reviews research in the field, but there is much more to find out. This wisdom has inspired sophisticated practices, such as distinguishing between core and fringe listeners, understanding how listener loyalty translates into donations, and learning how to design fundraising appeals to remind people of the importance of listening to public radio. This mental model of fundraising, however, assumes a one-to-one relationship between a station and a donor in the transaction of service and support and does not typically incorporate into the equation the social environment surrounding listeners and donors. Our research set out to study this social context surrounding listening to public radio and, in turn, donating. So, first, we review the research on how providing potential donors with information on other donors’ contributions affects donations. Second, we discuss the impact of such information on others’ use of or value of the organization. Models of charitable giving typically balance these two factors within the individual. In deciding whether or how much to give, an individual compares the value of an organization’s services with his potential contribution. He contributes up to the amount that he values an organization’s work. We argue for an expanded conception of an individual’s value of an organization that includes not only the value an individual receives but also the value his social network receives. What members of the network value increases their satisfaction and, thus, our own. Thus supporting services that provide value to one’s social network in turn supports one’s own values. Various research suggests that people’s behavior is driven by their perceptions of others’ behavior. These perceptions are termed descriptive social norms, which specify typical behavior in a given setting (what most people do), and differentiate this behavior from injunctive social norms, which specify which behaviors garner approval in society (what people ought to do). In Shang and Croson, we amended a script that volunteers used when listeners called to make a donation. 5 After being greeted by a volunteer, callers were randomly assigned to either a control group (where they received no social information) or to an experimental group in which were told, “We had another donor who gave X dollars. How much would you like to give today?” These amounts varied in increments of $75, $180, and $300, and we examined each increment’s impact on giving. Our findings indicate that providing social information increases donation amounts but that there is an optimal “specimen” amount. Figure 1 shows the average gift from new donors in the control group, where donors received no social information, alongside those in the experimental group, where callers learned about other donors having made a gift of $75, $180, or $300 (see figure 1, above). In this case, citing a prior donation of $300 was the most profitable and increased the amount of new donations by an average of 29 percent. For donors who called to renew an existing membership, a similar picture emerged. 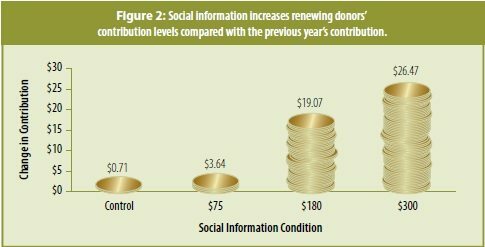 Figure 2 shows that donors not exposed to social information gave almost the same amount as they had given the previous year (with an increase of only 71 cents). Donors who were exposed to social information, however, gave markedly more than they had given previously. In the $300 condition, their contributions increased by $26.47. These results raise a natural question about the optimal level of social information to provide. After further research, we conclude that the ideal amount to indicate as a prior donor’s gift is between the 90th and 95th percentile of the value of previous gifts to the radio station. Higher levels of social information actually decrease individual giving. These studies all examine the impact of upward social information (where another donor has given more than the target). But what is the impact of downward social information? We answered this question using a direct-mail campaign for the same radio station. In this study, existing donors received solicitations to renew their membership. We collected data on each donor’s contribution from the previous year. Some donors received materials that indicated another donor had contributed exactly the same amount as the donor’s previous contribution (although donors were not reminded of the amount). Others received materials that indicated that another donor had contributed more than their previous year’s contribution. Still others received materials that indicated that another donor had contributed less than their previous year’s contribution. Figure 3 describes the change in donor contributions in each of the three conditions. Donors who received social information higher than their previous year’s contribution increased their contribution by $12 on average. Donors who received social information that was the same as their previous year’s contribution increased their contribution by $5.45 on average. 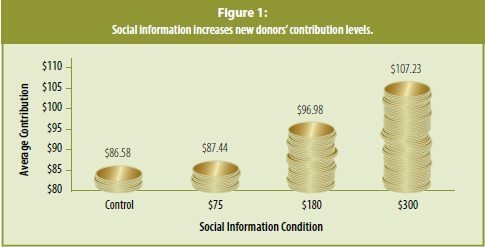 But donors who received social information lower than their previous year’s contribution decreased their contribution by $24 on average. This research illustrates two important points about social information. First, social information is as effective in influencing contributions when delivered via mail as it is when delivered over the phone. Second, downward social information has about twice the impact of upward social information. 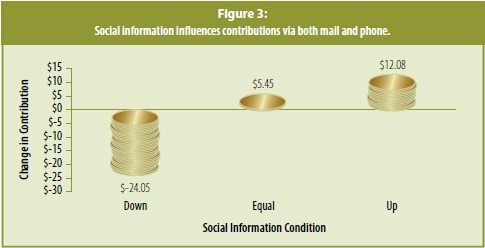 The reduction in contributions as a result of downward social information was twice the amount of the increase in contributions as a result of upward social information. For fundraisers, this suggests an important caveat. Appeals should be customized to donors to prevent giving too much downward social information, which often decreases contributions. Intuitively one might expect that prompting a donor to increase his giving one year might reduce his giving the next (a phenomenon known as intertemporal crowding-out). But this expectation turns out not to be the case. In fact, quite the opposite effect occurs. A year later, contributions from new donors who received information about a previous donor’s contribution are approximately $20 higher than contributions from donors in the control group who do not receive such information. Even with this result, we cannot conclude that the script donors receive in one year influences their giving in the following year. In a follow-up experiment, few donors remembered the script they heard a year prior, and it’s unreasonable to assume that the script has long-lasting effect. Instead the impact seems to be one of giving “stickiness.” A donor remembers giving more in the previous year (although not why he gave more), and this fact increases giving in the current year. Similarly, we anticipate that if an organization follows up with these donors with personalized request strings, this strategy may keep donors at this higher level of giving. In another study, Shang, Reed, and Croson examine the interaction between social information and social identity on public-radio contributions. 6 The project investigated whether donors give more money when they are told that a previous donor who shares their identity also made a large contribution. Extensive literature in consumer behavior shows that identity influences the effectiveness of social information—and for various reasons. 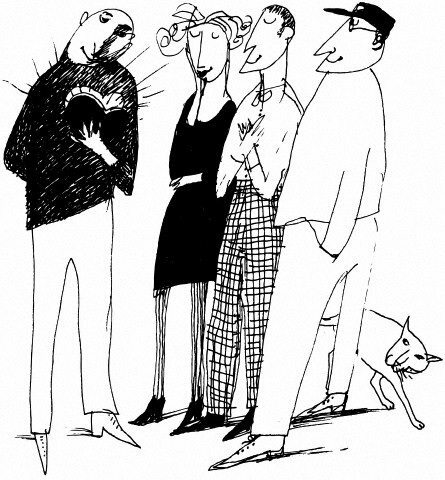 First, social identities may indicate the decisions or judgments at hand. Thus when the identity of others is similar to a target consumer’s identity, their behavior becomes more relevant to this consumer. Second, individuals may want to conform to the behavior of others like them, but not to the behavior of those unlike them. So the more similar an individual is to the source of the social information, the stronger the potential impact of this information. In this study, we used gender match or mismatch between a target donor and a previous donor. We chose gender because, in psychological literature, it is a well-established dimension of social identity. In various settings, males and females behave in ways that are consistent with those of the same gender. Therefore, in the domain of charitable contributions, we expected that gender identity could influence the strength of the social information effect that we have outlined above. 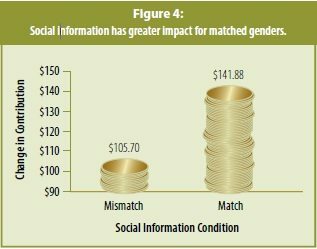 In this study, we changed the wording of the telephone script from “We had another donor who gave $300” to “We had another donor; and he [or she] gave $300.” We then compared contributions of callers whose gender matched that of the “other donor” and those whose gender differed from that of the “other donor.” No callers received the control condition or learned about other dollar amounts. Figure 4 shows the results. In cases where the gender of the caller was matched with the gender of the example, the amount of the gift increased by an average of 34 percent. This result tells us that individuals pay attention to social information and, in particular, social information from others who are similar to themselves. It also tells us that this information can dramatically increase giving. In theory, this effect is more likely when donors have strong social identity. Our own research supports this prediction. Individuals who more positively identify with being male (or female) demonstrated this effect more strongly. Social influence has a strong impact on individual giving. Informing donors about others’ donations can significantly increase or decrease their own donation. Choosing the appropriate level of social information to communicate is critical;? and our research indicates that contributions in the 90th or 95th percentile of the contribution distribution are high enough to induce increased giving but not so high as to scare off low donors. And social information that is lower than what a donor would have given significantly reduces the amount of a donation. The power of social capital in civic engagement has become well known. Fundraising professionals know that people do not give to causes but to people. This understanding has spawned literature and practice on peer-to-peer giving and solicitation, where current donors solicit or recruit new donors using existing social networks. In light of this, we’ll now consider two questions: Is the size of a potential donor’s social network correlated with the level of contribution? And does the priming of the social network drive this relationship? The first question draws directly from previous research, which demonstrates that larger networks affect behavior in other domains. In particular, we hypothesize that the value an individual receives from a radio station depends not only on the value he receives from listening to the station but also on the value his social network receives from a radio station’s services. As the social network grows, an individual’s total value received from the station’s services also grows, which increases his willingness to contribute to the station’s continued operations. Note that, as we outlined at the beginning of this article, this hypothesis expands the notion of individual value (or exchange) to include value received directly (as previous work has hypothesized) and indirectly (via the social network). Our study also explored the question of whether, when a donor makes a donation decision, he considers the indirect value he receives from an organization’s services. If a potential donor is primed to consider his social network, this indirect value will be highlighted and included in his calculation of how much to give. Thus we expect that the size of a donor’s social network is related to his contribution—especially when this factor has been primed before a donor makes his contribution decision. In a field experiment at a public radio station, we tested these hypotheses. The station has three on-air fund drives per year. DJs request donations and suggest a variety of contribution levels. A $120 gift makes the donor a basic member;? listeners who give $150 to $180 receive additional gifts. Other gift levels are $240, $365, $500, $1,000, $1,200, $2,500, and $5,000. In response to these appeals, listeners make contributions over the phone. In the experiment reported here, we asked callers about their social networks before or after they made a contribution. We then examine the relationship between the size of a donor’s social network and the amount contributed. Conducted in 2006 and 2007, the experiment collected data on 547 callers to a public radio station in the Midwest during a fundraising drive. During the on-air drive, station DJs interspersed news and informational programs with appeals for donations. Listeners responded to on-air appeals and called the station to make a pledge. Experimenters answered the phone as volunteers for the station, asked the routine questions for the station, then implemented the test in the appropriate place in the conversation. We asked all callers how many of their friends and family also listened to the station and recorded the outcome (i.e., the size of donors’ network). For half the callers, all of whom were randomly selected, we asked this question before they made their contribution;? for the other half, we asked after. Overall, we found a significant (and large) effect of the size of the social network on giving. For each additional person in a caller’s social network, the donor contributed slightly more than $1 ($1.32). One of the questions was, does it matter when callers are asked about their social network? For fundraisers, our results have interesting implications. According to the data, when individuals have small social networks, priming is likely to be ineffective and may even reduce their contribution relative to what it would have been without their being primed. When social networks are fewer than 20 people, callers who are not primed give more than those who are primed. But when individuals have large social networks (of more than 20 people), priming increases contributions. Thus, one recommendation for fundraising practitioners is to selectively prime individuals who they believe are well connected and to avoid priming others. A second recommendation is for an organization to increase the size of a donor’s social network. This can be done in several ways, including (1) encouraging a potential donor to introduce his existing friends and family to an organization and its mission (a variant of recruiting) or (2) providing opportunities for existing members of an organization to become friends and thus join one another’s networks (via social events among donors). Our research suggests that these activities can increase the social networks of existing donors who, when primed, will subsequently increase their giving. As fundraisers approach their work, this research provides insight into the psychology of giving and provides another tool in their tool belt. But as with any research, this body of work has limitations. First, as mentioned above, public radio is an interesting and important domain to investigate social influences. But with field experiments, generalization is always a concern. Testing similar interventions in other nonprofit settings would be useful. Second, we have reported on two particular social influences on giving (social information and social networks). But there are certainly others that are possibly even more effective and have yet to be tested. The potential influences on why and how much donors give are important to those of us working to raise money for nonprofits. At minimum, however, this research indicates that providing information to donors can improve giving rates, and organizations can work to tailor and test these initial results to their environments. Rachel Croson received her Ph.D. in economics from Harvard University in 1994 and is currently a professor at the University of Texas at Dallas. Jen Shang is the world’s only philanthropic psychologist and is an assistant professor at the School of Public and Environmental Affairs at Indiana University–Bloomington. 1. Corporation for Public Broadcasting, Corporation for Public Broadcasting Annual Report 2006. 2. “Audience Research Analysis”, 1988, 1998, 2010. 3. Elliott Aronson, The Social Animal, 10th ed. New York: Worth Publishers, 2007. 4. “Audience Research Analysis”, 1988,? 1998, 2010. 5. Jen Shang and Rachel Croson, “Field Experiments in Charitable Contribution: The Impact of Social Influence on the Voluntary Provision of Public Goods,” the Economic Journal (forthcoming). 6. Jen Shang, Americus Reed, and Rachel Croson, “Identity Congruency Effects on Donations,” the Journal of Marketing Research, vol. 45, no. 3, 2008, 35–361. Jen Shang, PhD, is an assistant professor and philanthropic psychologist at the School of Public and Environmental Affairs and the Center on Philanthropy at Indiana University. As we march toward the fiscal cliff, everyone knows that tax reform is on the table in negotiations between President Obama, the Democratic Senate, and the Republican House of Representatives. For a perspective on the importance of the content of taxes for nonprofits, we are pleased to again present this important perspective by Kim Klein of Klein & Roth Consulting that should make nonprofits consider their stake in the tax reform debate. What are they willing to push for and to give up—if anything—in the context of responding to sequestration and dealing with the nation’s budget deficit?